Not exactly a failure yet, but not a good start, either. No pictures... steel beam, not concrete... no yielding? possible brittle fracture from some triaxial condition... don't know, not enough information. Roof beam supporting the roof garden.. Who knows at this stage. Possibly a major error in calculating roof loads.... Possibly just cheap steel.. Possibly not a 'crack' at all because reporting this type of thing is notoriously poor. 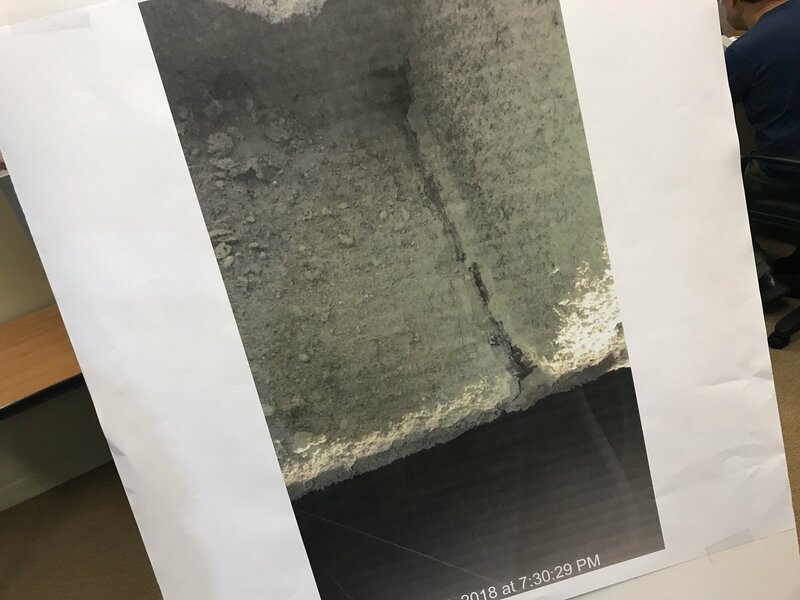 "...said the crack was found near a weld on a stress-bearing horizontal beam. 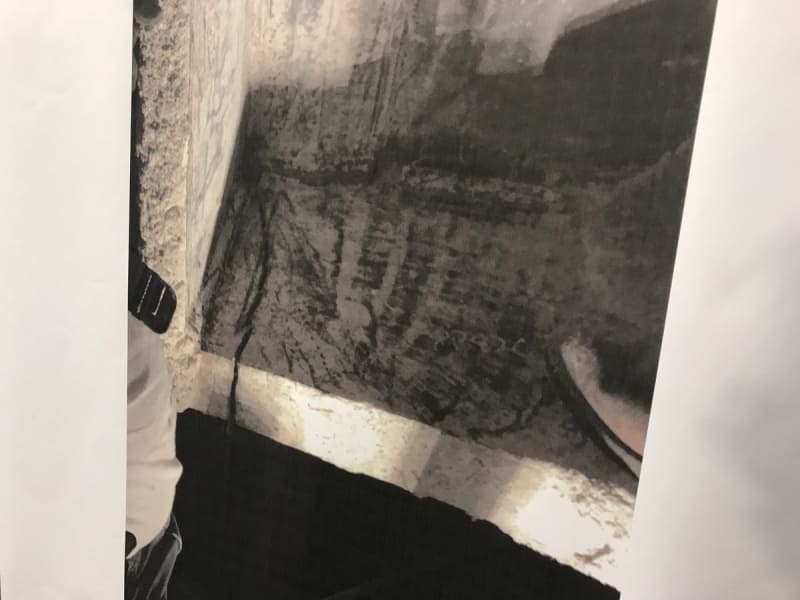 He said he did not know how long the crack was, but he told reporters that American steel was used in the center’s construction." Or weld joint detail that didn't consider fatigue due to springiness of the span. The article linked in the original post calls it a 6' tall beam. Assuming that is correct it must be a deep plate girder. I wonder if its a flange to web weld? It will be interesting to see pictures when they come out. Didn't know where the crack started. That's what made me think of a tri-axial condition initiating a brittle failure. 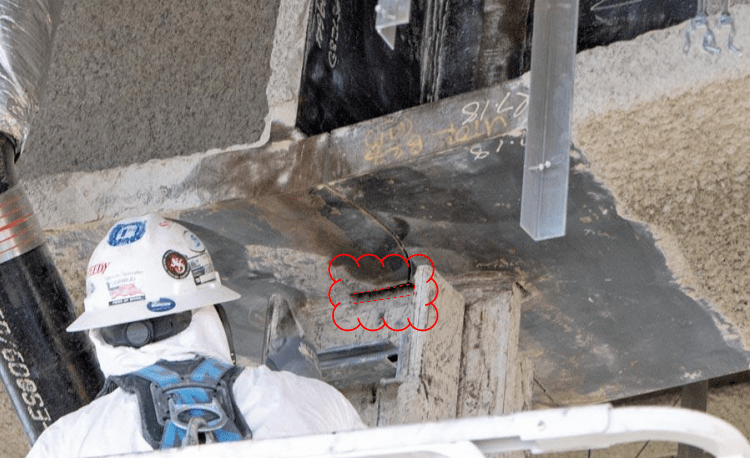 What we've seen most often with that size plate girders is poor connection details that result in rigid restraint in corners (such as a stiffener welded to a flange and web without clipping the corner of the stiffener), leading to massively high stress concentrations. Don't know if it's anything of the sort here, since currently have no information about where the crack, if it even is a crack, is located. At this point, we can only offer wild speculation. 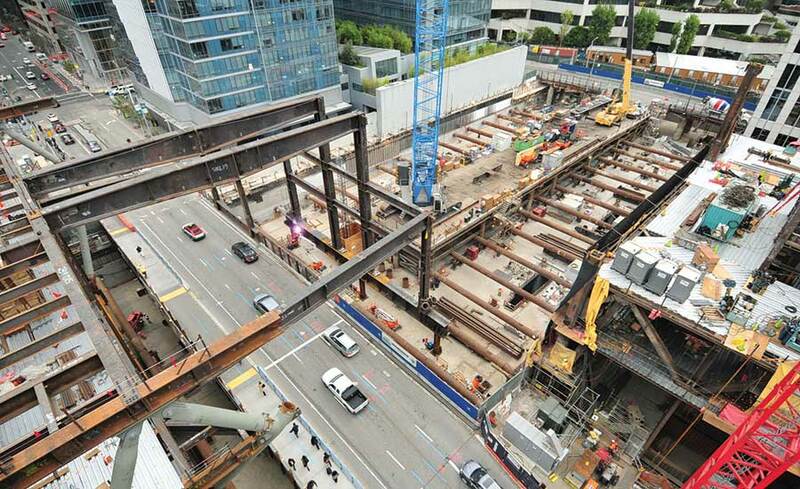 Skanska won the Steel Supply & Erection Contract. Are you the mayor, chief engineer, attorney general, chief of police and head librarian for San Francisco by chance? Star for you again. Concerning crack for certain, looks like stiffener/web/flange interface origination as HotRod10 speculated. a number of beams. The remaining 4 percent of the life was spent in propagating the crack across the flange width and into the web." Is that the beam in question or is that just an example of a cracked beam? JAE, refer to epoxybot's post and links @ 27 Sep 18 00:50. It looks like a lot weld in that section so may be weld shrinkage cracks? 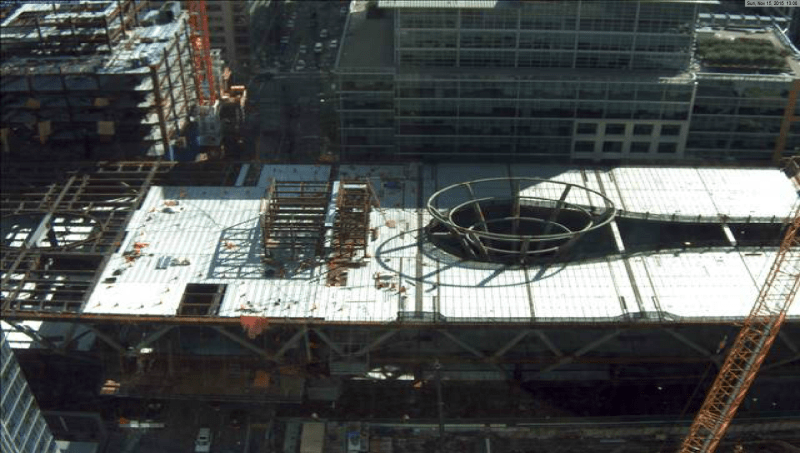 The area close to the weld would have reduced fatigue allowable as well but the structure isn't that old so it doesn't seem like a roof area would get a lot of high cyclic loading. I reminds me of a torn clip angle I saw recently. I can't be sure but I think the tear happened when the structure experienced a shock load from an explosion in another part of the structure. I wonder if there was some shock to the tower? Maybe a dropped load of material? 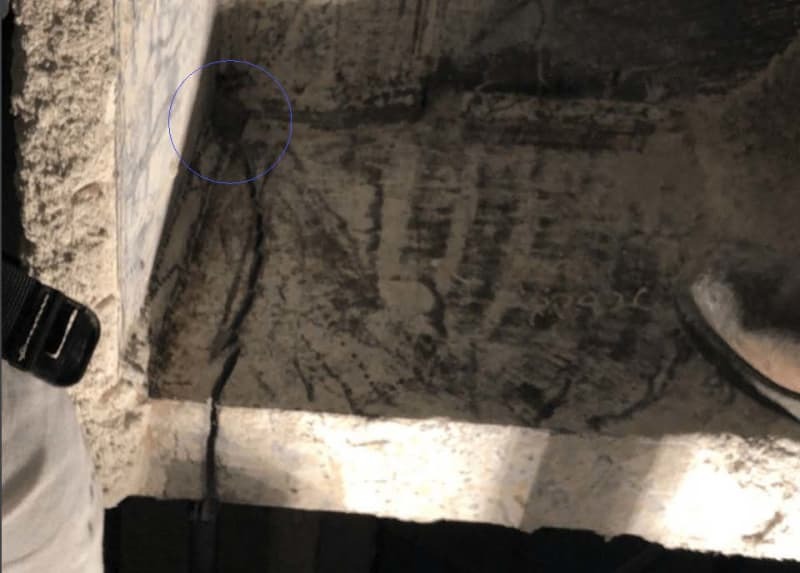 Finally, one article mentioned the same crack at two beams – so maybe bad detail at the connection resulting in high weld shrinkage stresses. If that is the problem they would need to make some remedial repair to every location with the detail. bimr - thanks...I was just too lazy to look at the links I think. That center section is highly indeterminate (and highly fixed) so the potential stresses due to temperature, displacement, or misalignment effects could be massive. Another engineer in our office who looked at it proposed that the cracks may be due to too much or too little preheat for the welds, considering the flanges are 5" thick. It's supposedly very tricky getting preheat right for something that thick. I was going to ask about "weld metal" (manufacturer of the rods, rod disciple, inspection results and welder performance), but this particular crack is near the welds, but not across them. Preheat/no PWHT stress problems are likely. Has the steel grade been mentioned? I would agree with HotRod10 on the possible critical control of the preheat. Sure would like to see the welding procedures and the mill certs as well as the welders qualifications. Probably special inspection and tests were required. There's some good welding consultants and metallurgists in the SF area who have a lot of experience with the Bay Bridge issues. 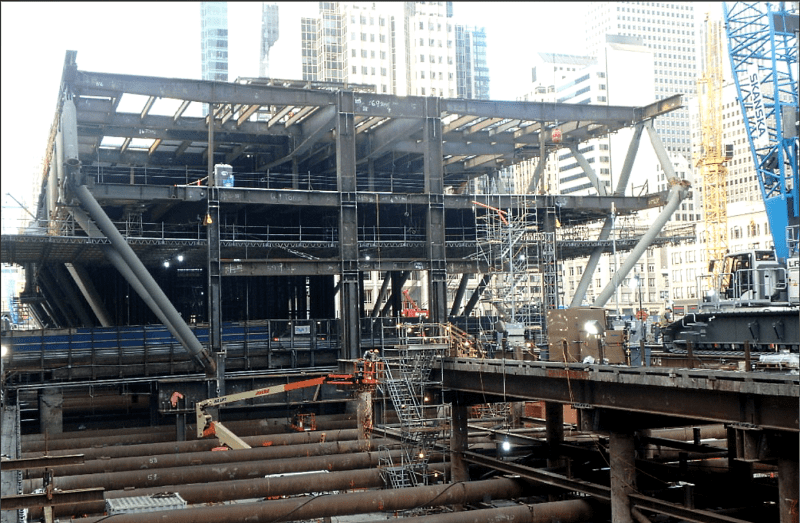 Read Emily Pollock's article on the Transbay Terminal on Engineering.com and let us know if we missed anything. Um, the beams only cracked, they didn't collapse, right? I'm still not clear on where these beams are supported and how they span. 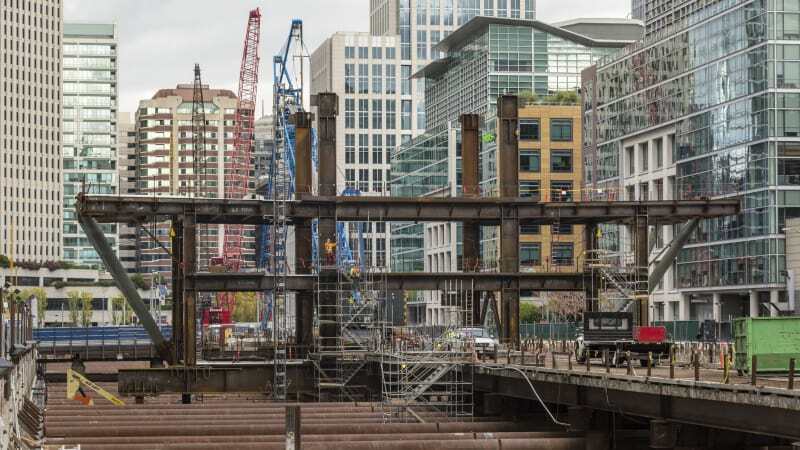 They are deeper in the middle, which would indicate they are supported at the ends, but there is supposedly a "column" at the middle, which I would have assumed was actually a tension strut (an assumption bolstered by the statement in another story saying the beams "support" the weight of the bus deck below). 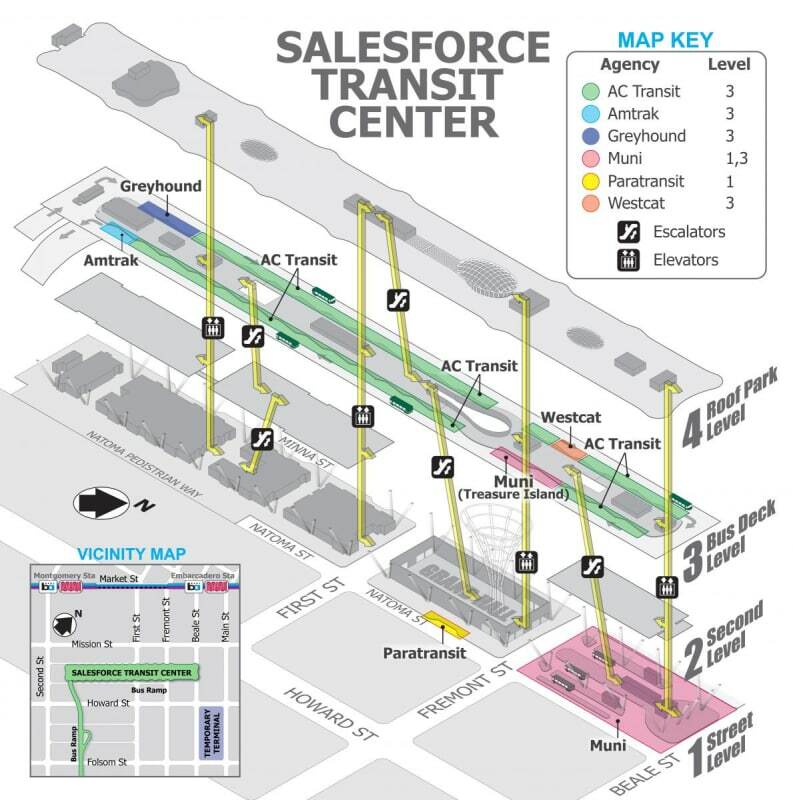 However, the graphic depiction from the SF Chronicle shows an arrow under the "column" pointing upwards, indicating it is actually a support column. Article seems to be in line with other information I have read about the situation. The graphics is a very nice touch. A coupe of comments (not really about the article). I used to work in offshore and we did a lot of very deep very heavy plate girders. I was onsite at the fabricator and used to watch them (not as inspector) weld up the plate girders. There is a lot that goes into this type of fabrication so I would question if the engineer/detailer/fabricator had experience in similar heavy plate design and fabrication. 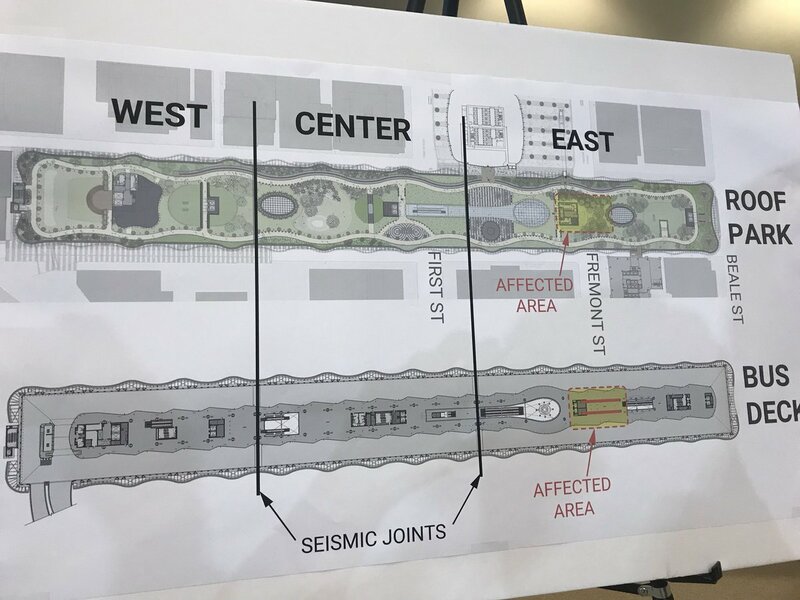 Personally I find professionals who speculate on causes in situations like this in a forum read by the public without access to all the design information (drawing, details, etc.) to be doing a bit of a disservice. I don't think any of the statements are false but they could imply gross amount negligence on the part of the design engineer. I don't know the full text of what was said but as reported the statement about too much weight on the beam implies a design error in the loads which is a pretty serious accusation. Maybe to laypeople that doesn't jump out but to me when I am involved in a forensic investigation I am very careful not to even imply a design or fabrication error unless it can be conclusively proven. Commenting on observable facts and translating the situation into laymen's terms would be a more appropriate course in my opinion. Regarding the beam/column - I would call that column a hanger since it appears to be holding up the deck below (and in tension). That is just my opinion - maybe AISC has some standard glossary of terms? Hopefully when a full report is issued we'll be able to read it and learn from whatever mistake(s) were made. It looks like the cracks are in the bottom flange but I can't really tell for sure from the limited information. Assuming that's correct, could not this be caused at least in part due to an overloading of the beam in the middle, which could be caused in part by settling of the supporting column?. I realize the forces are very complex but if the beams have failed on the tension member, and the structure seems to have moved somewhat in order to produce a gap, I wonder, as this is right next to the Millenium Tower. Now that I see where the cracks are located, in addition to the aforementioned potential issue with weld preheating, another possible contributing factor could be moment on the hangers due to unanticipated movement of the bus deck below. Of course, the restraint effects of using a web as thick as the flanges, which is not typical for large I beams, is also a big question in my mind. No Kidding! 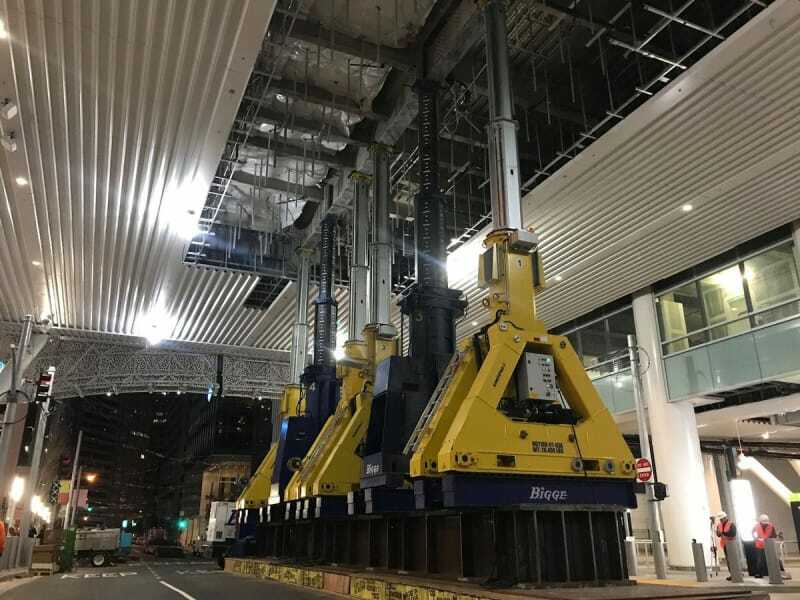 Largest bottle-jacks I've ever seen. @RoopinderTara -- "Apparently, the mistake is still under investigation" seems like odd phrasing. Did the author mean "The apparent mistake is still under investigation"? As written, it implies that the status of the investigation is unknown, which seems unlikely. OK - so that beam was temporarily supported. Not knowing the entire configuration of the structure my mind immediately asked - what other beam-cracks may have occurred and where? The yellow jacks are 100 ton capacity and the blue jacks are 800 ton capacity. Looking north with Millennium Tower on the right. Steel having just spanned Fremont St. I'm curious how that raft is constructed and what the target bearing pressure is for the street. Really, only 100 ton capacity...from a hydraulic/ram area perspective they look like closer to 1,000 ton capacity. Given their effective length I can see reductions in the load capacity, but only 100 ton. I have several 100 ton hydraulic hollow rams and they are 8" diameter - sure, they are only 8" tall. 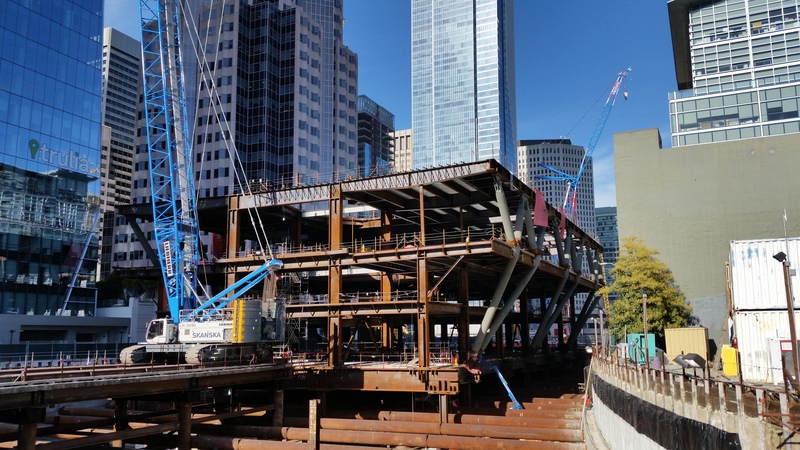 So in the SF Bay Area erected structural steel work goes for about $8,000 per ton - I know this was a one-off type project, and used Buy America steel, but wow! And I only got $0.06 per pound ($120/ton) for steel scrap earlier today. Lucky you. In my area we have to pay the recyclers to dispose of steel scrap. Really, we do. Really, only 100 ton capacity...from a hydraulic/ram area perspective they look like closer to 1,000 ton capacity. I think the limiting factor is the telescopic part of the shoring. It looks to be made of aluminum. 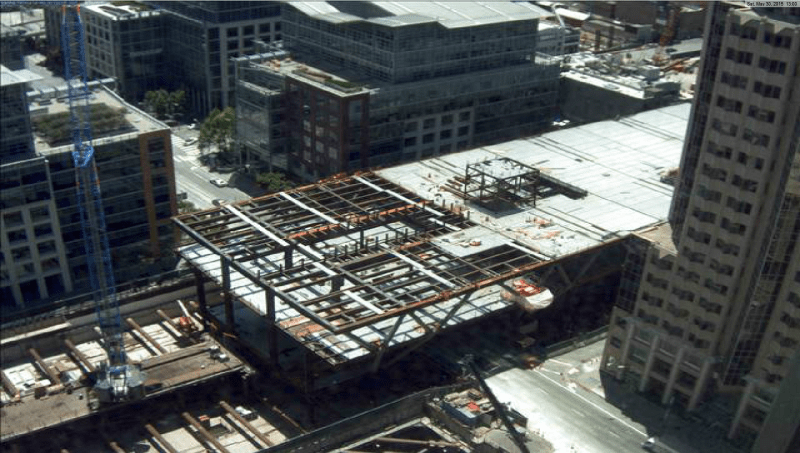 Google Streetview's time machine gives a good look at the Bus Level steel. 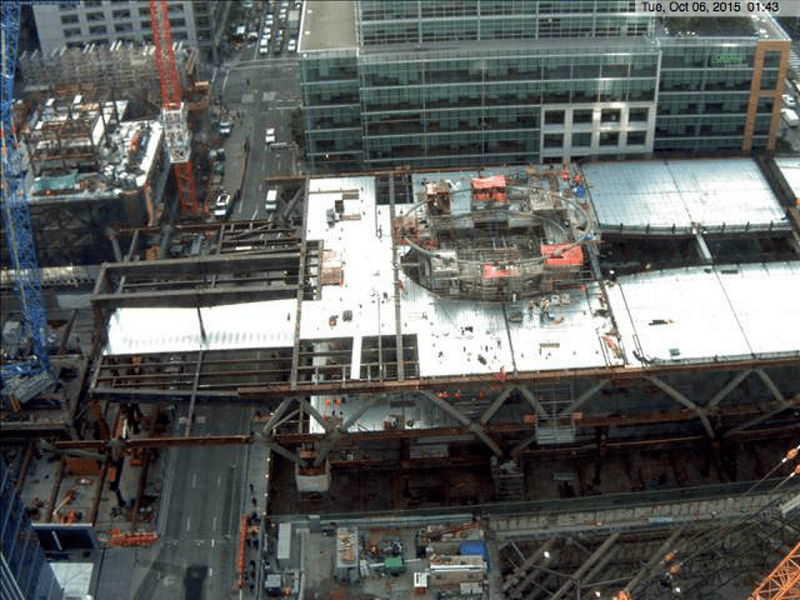 The central N-S Floor Beam is spliced in two places. The splices are just outside the line of the central columns. The 1st St. & Fremont St. steel is slightly different. 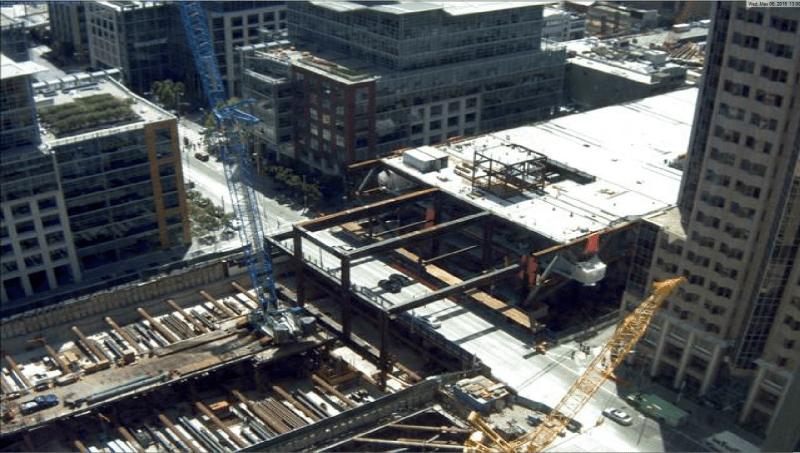 "So in the SF Bay Area erected structural steel work goes for about $8,000 per ton..."
Most of our bridges are about half that, but some of our more complicated sign structures, with big curved pipes, catwalks, railings, etc. are in that price range. Scrap steel has been between $0.02 and $0.05 per pound, if you take it to one of the actual scrapyards and throw it on the pile yourself. The other recyclers have a dumpster that you can throw it in for no money either direction. Old car batteries are where the money's at. @hpaircraft: Thanks, article correct with your input! @IRstuff: Thanks for your comment. It was an odd phrasing. Corrected. 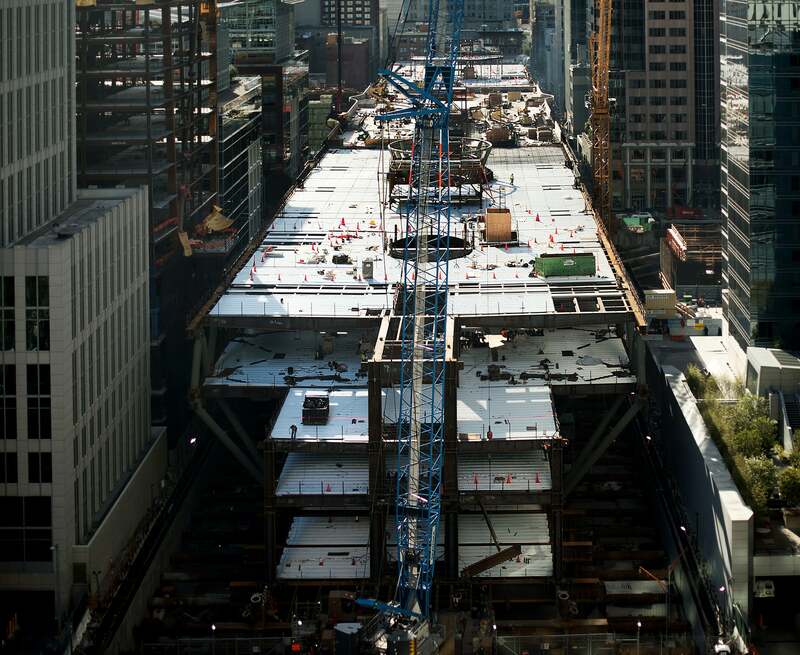 An excerpt- "San Francisco city officials are withholding $9.6 million meant to fund expansion planning for the Salesforce Transit Center, in a bid to hold its leadership accountable for alleged mismanagement of the $2.2 billion project." "Instead of paying contractors who try to make up deficiencies, they witheld payment to Webcor/Obayashi and some of the (subcontractors)." Instead of paying contractors who try to make up deficiencies, they witheld payment to Webcor/Obayashi and some of the (subcontractors)." ...who have now sued the TJPA for $150M for breach of contract. "Towering Over The Bay", title of the latest Civil Engineering ASCE magazine featured on the cover. Article starts on page 44 and continues to page 53. Impressive. Has anyone considered the ASIC provisions for transverse stiffeners? 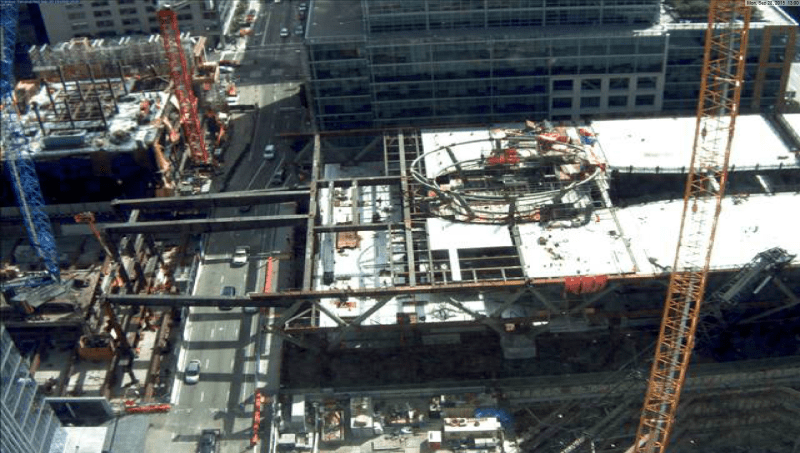 Specifically, I'm looking at AISC 360-05, section G2.2 which says, "The weld by which transverse stiffeners are attached to the web shall be terminated not less than 4 times nor more than 6 times the web thickness from the near toe to the web-to-flange weld." I think it's in section 3 in 360-14? Perhaps this has been pointed out -- I haven't read the whole thread, but didn't see anything about this section after a quick page search. Don't think I agree. Full-depth stiffeners are pretty common. Haven't designed plate girders since school but I had thought that you actually needed full-depth stiffeners to consider tension field action, partial depth stiffeners won't cut it. You also see full-depth stiffeners used pretty commonly in beam-column moment connections as well. The sentence immediately preceding the 4-6 web thickness requirement discusses stopping stiffeners short of the tension flange when you don't need the stiffener to bear on the tension flange to resist a concentrated load or reaction (like you would for tension field action or stiffening a column at a moment connection). So I've always consider this 4-6 web thickness requirement to be specific to partial depth stiffeners. Looks like a very tight re-entrant corner. Maybe there were some flaws in the original plate that opened up into cracks once real load was put on the joint? Well MrHershey and Ave85, I think you're both correct. 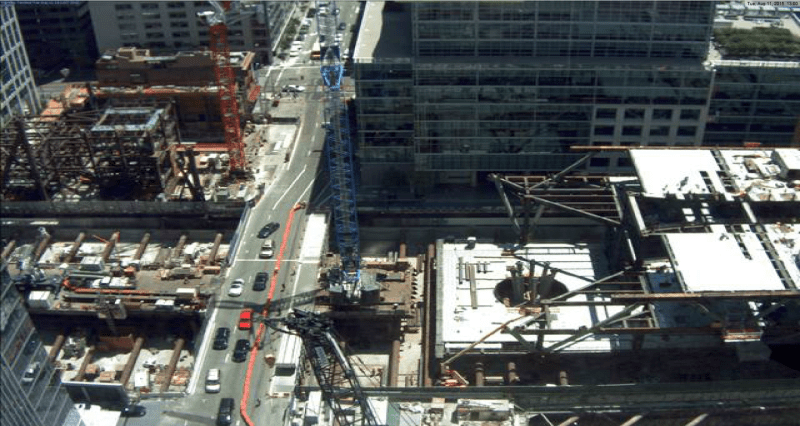 The stiffeners for plate girders typically are full depth. However, we clip the inside corner the 4-6 times the web thickness from the flange (at the web) and 3/4" from the web (at the flange). We then hold the welds back a 1/4" from the end of the clip. Edit: Apparently, some like VDOT and WSDOTclip the stiffeners, as we do. Others may not, but I don't know of any that currently detail transverse stiffeners without a clip. Sure. Maybe I mis-typed. I'm not pointing to full-depth stiffeners. I'm pointing to full-depth welds. Welding is known to reduce the strain capacity of steel, which is why I think the code requires that welds be held back from the tension flange. I think this is specific to web stiffeners on plate girders, and there are different requirements for moment connections, concentrated forces on WF shapes, panel zones, protected zones, etc. Changes after shop drawings. Often means it was not buildable as drawn. "The holes were added after shop designs were submitted for approval. So, Herrick crews first built a set of girders without the holes and then had to build a new set of girders with them included, he said. “Why they were added, that’s more of a design issue than a fabrication issue,” Hazleton said. 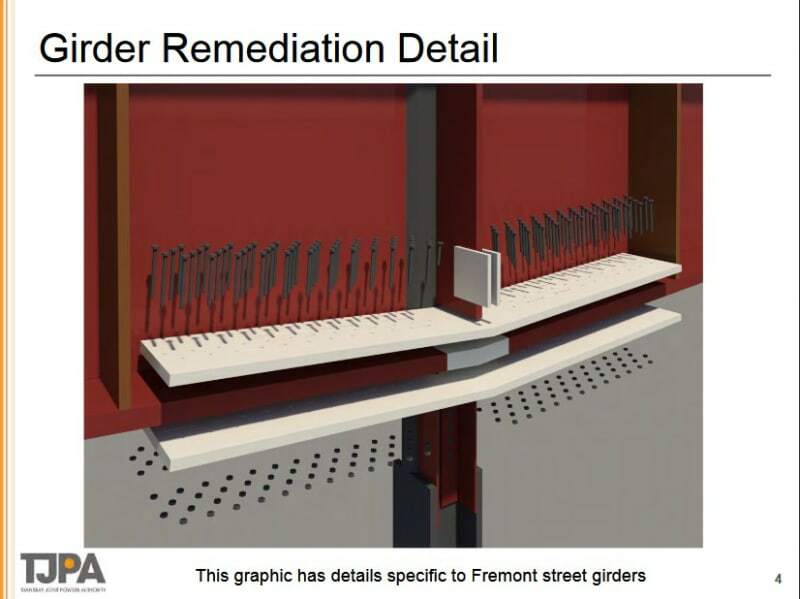 A representative from Thornton Tomasetti, the design firm, declined to explain the purpose of the holes." The flange holes appear somewhat contentious between EoR and fabricator - why were they were added and who requested them. Interesting place to locate two 2" x 4" flange holes (each side of web), and allow a hanger plate to pass through, so as to connect the back-to-back vertical channel hangers. At what point should this design have been done per AASHTO instead of IBC/AISC/AWS? It looks like a lot of CYA will happen as to how the holes should have been finished. 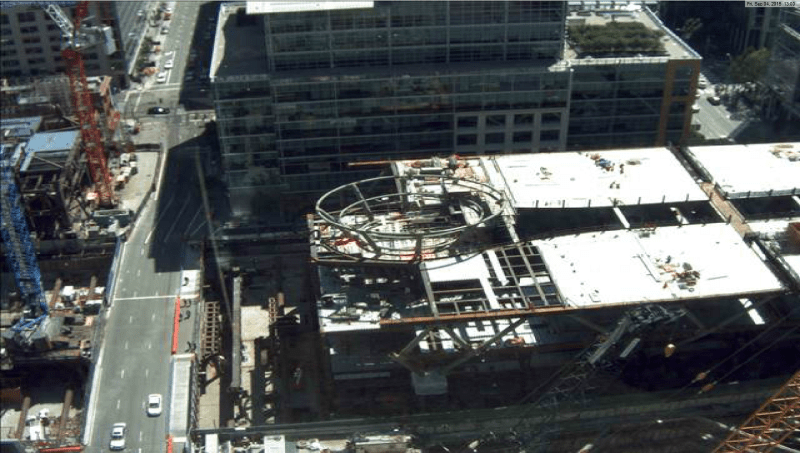 However my quick scan of AWS doesn't seem to say a weld termination finish in cyclically loaded structures to be different than weld access holes. nor dye penetrant or magnetic-particle inspected. 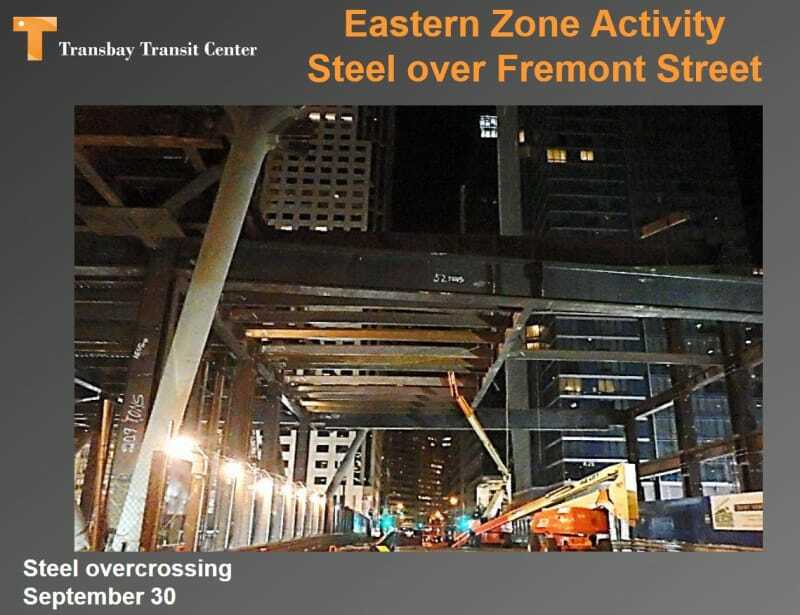 apparently caused brittle fractures in the bottom flanges of the center's twin built-up plate girders that span 80 ft across Fremont Street. All three ingredients were needed for the brittle fractures. The fix is underway. Further review of the rest of the structure for potential of further cracking continues. 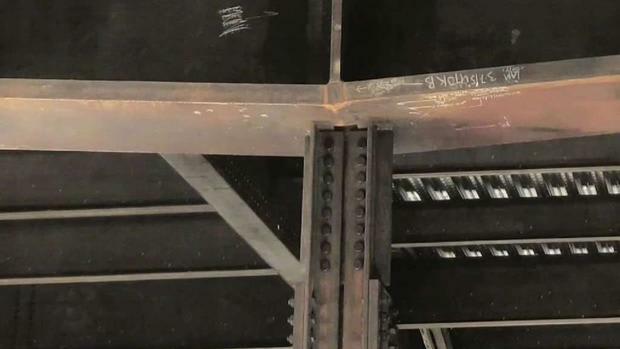 1) They cut a hole in the tension flange of a girder at the maximum tensile stress location. 2) They put a kink in a 4" thick plate at the maximum tensile stress location. 3) They welded a stiffener to a 4" thick plate at the maximum tensile stress location. It took us about 2 minutes to come up with an alternate configuration that would have been be far better for the beam: 2 Beams a few feet apart with a pair of diaphragms running between, sandwiching the hanger strut. Using a wider and thinner flange would have helped considerably with fabrication, as well. 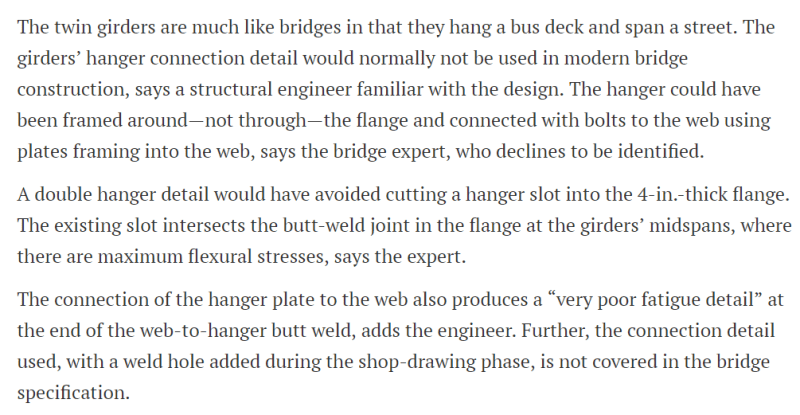 In reading the ENR article more thoroughly, I noticed they utilized a full-penetration weld to connect the flange sections together at midspan. That would seem nearly impossible to do adequately for a 4" thick plate. The slot for the hanger plate also follows the taper of the hanger plate as it goes from 4" in the middle to 1.5" at the end, making the slot diamond-shaped, which is a poor fatigue detail. Using a continuous flange plate, bent over a long radius curve and using an oval hole around the hanger plate would have decreased the susceptibility of the flange to fatigue cracking. Apparently they drilled in the rat holes AFTER the welds were done and then didn't grind them smooth. The article also mentions that there was a problem with the actual steel material but didn't go much further in explaining that. Here's a longer recent (March 29) article from ENR. I wish the included shop drawing sheet images were linked to larger pdf's as you can't really read the markups. If you click on the link it will ask for a sign-in, click the "X" to close the window and the PDF download will pop up. I don't know if this has been posted "Root Cause Assessment of Fractured Girder Flanges" presentation by LPI Consulting Engineers. 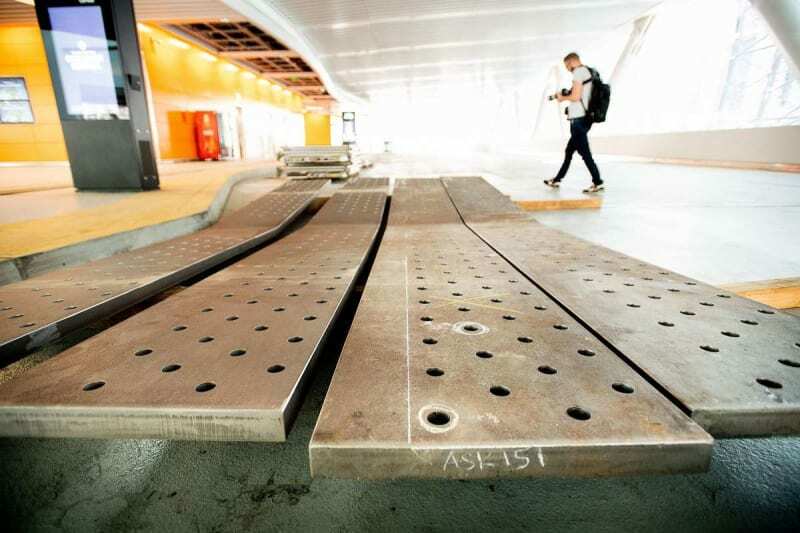 Four-inch thick steel plates to repair and reinforce the four beams have been delivered. I haven't been following closely enough to know if this is correct, but the plates they show only look to be 2" thick at most if the bolt holes are 1-1/2" diameter. Maybe they mean four 1-inch thick plates? Perhaps it is 2 inches top & 2 inches bottom for a total of 4 inches.